Tamzin Barroilhet's last trophy came in 2010 when she captained the Great Britain U20 to success in the Division B European Championship. Now in her final year at Kent State University she has an eye on the MAC conference title and a trip to the Big Dance. Barroilhet has a habit of picking up gold in her final year of anything. She picked up a French national title at 12 with her departmental team while signing off from Bourges Basket in 2009 with a double championship medal. In her last game as a youth international she collected the winner's trophy. A few things have changed at Kent State this year after long time coach Bob Lindsay's contract was not renewed. The new coach Danielle O'Banion has made Barroilhet one of the three captains for the coming season. With what they call MACC Madness (an event to mark the start of the basketball season), Barroilhet's season is now under way. Barroilhet like many foreign students has picked up an American twang but besides this nothing much has changed for her since leaving France. She still checks her kit bag at least five times before a match and experiments with food. 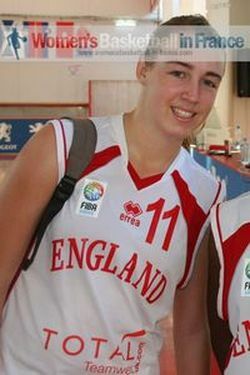 Tamzin Barroilhet made a choice at 17 to play international basketball for England and Great Britain, which has meant international summer basketball from 2007-2011. It was while playing for Great Britain in 2010, she broke the hearts of the hosts Macedonia with a hop-skip-and-jump lay-up practically on the buzzer. In the summer of 2011 she played at the World student game. After sitting out her first basketball year in College, her mother decided to surprise her daughter and came over for her daughter's first home game, on the 28th November 2010. Tamzin's first five shoots hit the target that day and her NCAA career took off. With no beaches close by to distract Tamzin, her focus will be making her final season a perfect one on the basketball court and in the classroom. She may also have time to change her play-list on her ipod, although her favourite song "Ain't No Mountain High Enough" by Marvin Gaye sums up Barroilhet.